changes or cancellations are possible between the first payment and the second. Each and every group member will have to show a valid Photo ID upon check-in. 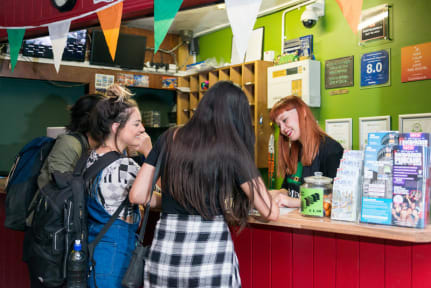 Located in the heart of Dublin's historic city centre, The Times Hostel - College Street is the perfect base for all tourists and backpackers looking for a modern, stylish, clean, safe and friendly hostel in the centre of Dublin. Whether you are in Dublin for a day or a week, The Times Hostel - College Street will make you feel right at home with its super-friendly staff, cosy bedrooms, fresh linen, fully-equipped kitchen, common/chill-out area... and even home-made meals on selected days! We have a mountain of free stuff available:free ice cream on Mondays, free wine and cheese on Tuesdays, free dinner on Wednesdays, free coffee, tea and hot chocolate all day, free Wi-Fi, free maps and guides, free luggage storage, free bed linen, free book swap and a free daily walking tour of Dublin! The default check-in time is 15:00 . Valid passport/ID required on check-in. Groups are subject to our hostel group policy. It was an amazing experience! I highly recommend it to anyone. The main quality of the hostel is people, since the employees were very nice the whole time and I made a lot of friends, but everything else like location, cleaning and security are great as well. segunda vez que fico no hostel, é muito bom!! It is a very nice place with a nice staff. The best part is the location. Ponto mais positivo é a localização sem dúvidas.